[Galaxy S7 Flat/EDGE]Is it normal if the edge of the screen appears green in color? Your device is not faulty. The colors on the curved screen may look different depending on your viewing position. The slight green tint in colourat the edges of the Galaxy S7 edge display that you may observe on occasion is due to a phenomenon called WAD (White Angular Dependency) which is due to the inclined curved surface of the S7 edge screen. 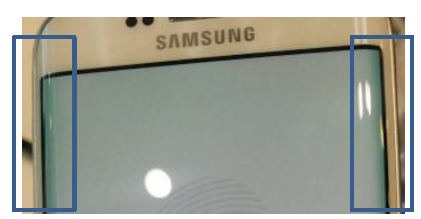 For an AMOLED display, the WAD phenomenon results in the colourwhite sometimes appearing to have a Green tint, or on occasion a Blue or Yellow tint when viewing the AMOLED at an angle. But when viewing directly from the front or side the colourwill be as expected. [Galaxy S7 Flat/EDGE] Is there a risk of short circuit if we charge while USB port is wet?